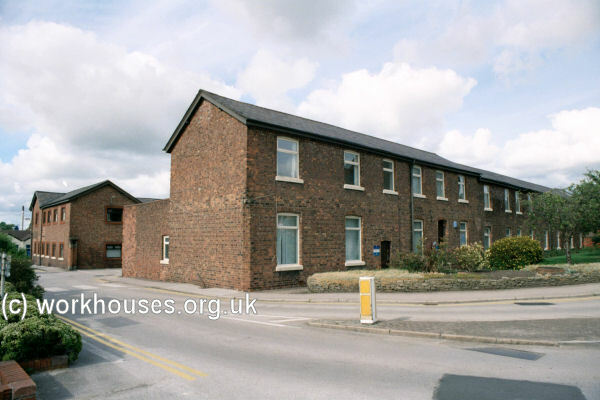 Ormskirk's first workhouse dates from 1732 (Hitchcock, 1985). A parliamentary report of 1777 recorded local workhouses in operation in Ormskirk (for up to 114 inmates), Aughton (114 inmates), and Melling with Cunscough (50 inmates). 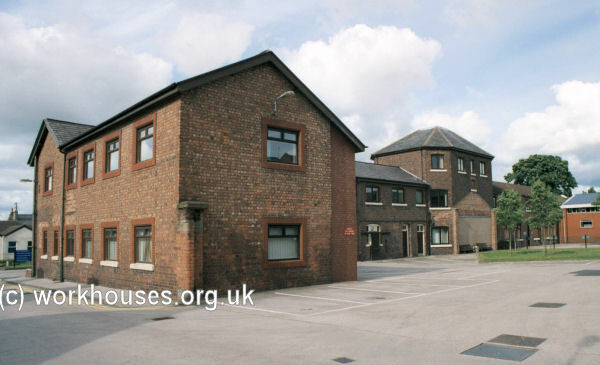 Ormskirk's workhouse was on Moor Street at the east side of the junction with what is now St Helen's Road. Ormskirk Moor Street workhouse site, 1849. The Melling with Cunscough workhouse may have been what is shown on the 1848 map as Poor Houses just to the north of Kirkby Station. Melling Poor Houses site, 1848. County of Lancaster: Altcar, Aughton, Bickerstaffe, Birkdale, Bispham, Burscough, Down Holland, Formby, Halsall, Hesketh with Becensall, Lathom, Lydiate, Maghull, Melling, North Meols (2), Ormskirk (3), Rufford, Scarisbrick, Simonswood, Skelmersdale, Tarleton. Later Additions: Ainsdale (1894-1925), Southport (1894-1930). The population falling within the union at the 1831 census had been 30,568 with parishes and townships ranging in size from Bispham (population 256) to Ormskirk itself (4,251). 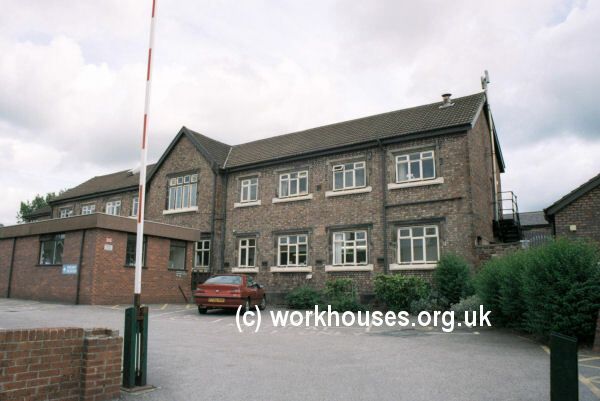 A new Ormskirk Union workhouse was built in 1851-3 on a site at the south side of the Wigan Road in Ormskirk. 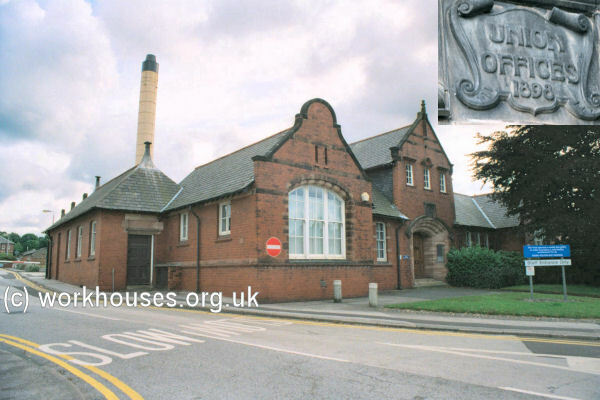 It was designed by William Culshaw who was also the architect of much larger workhouses for the Toxteth Park and West Derby Unions. His design for Ormskirk was based on the cruciform layout that had been popular in the peak workhouse building period of 1835-8. The workhouse location and layout are shown on the 1908 map below. The two-storey entrance block stood facing the road at the north. Ormskirk front block from the north-west, 2001. To the rear, four wings radiated from the central octagonal hub. Ormskirk west and east wings and central hub the south-west, 2001. A separate detached block lay to the south-west of the main building. Ormskirk general view from the south-west, 2001. 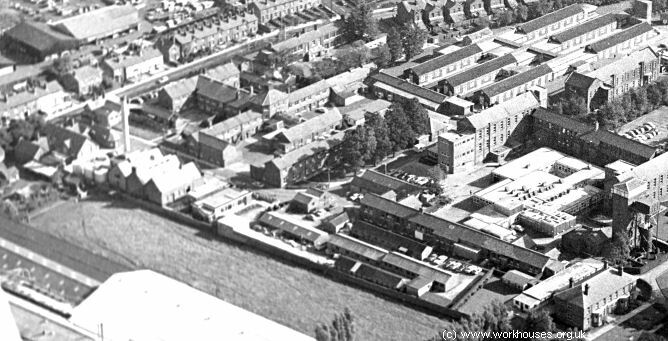 In 1898, new Union offices were erected to the west of the workhouse. Ormskirk Union offices from the north, 2001. Ormskirk workhouse later became the Ormskirk and District General Hospital. Ormskirk General Hospital from the south-west. The following collection of remarkable photos, dating from the early 1900s, paint a vivid portrait of the workhouse and its inmates and staff. They were kindly contributed by Betty Underwood, author of a book on the Ormskirk workhouse (details below). 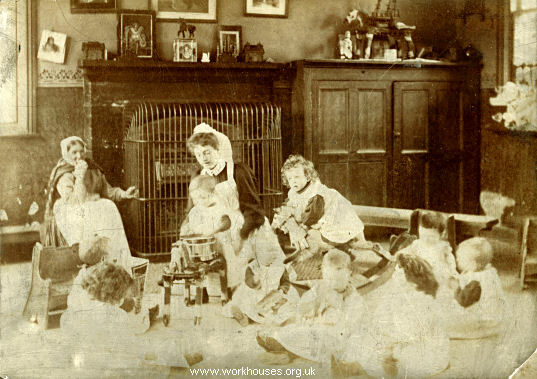 Ormskirk workhouse babies' ward, c.1900. 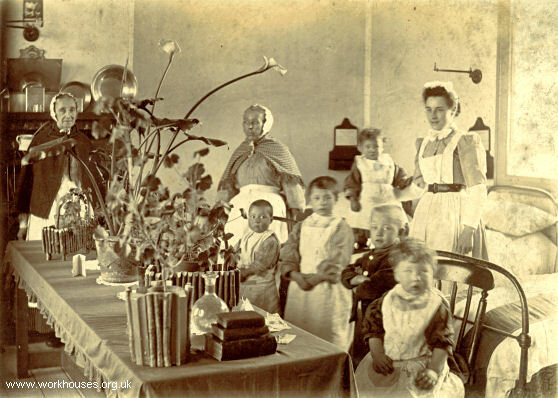 Ormskirk workhouse children's ward, c.1900. 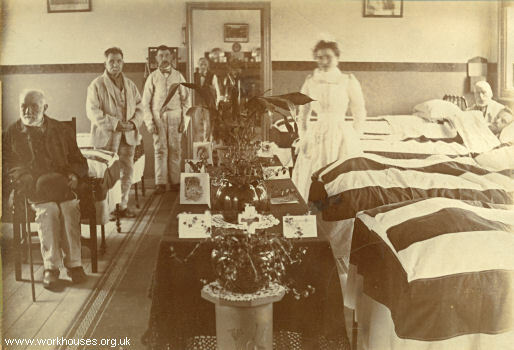 Ormskirk workhouse men's ward, c.1900. 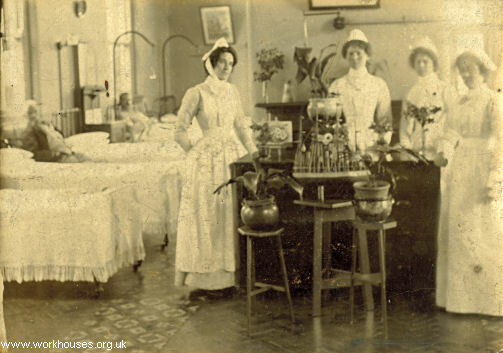 Ormskirk workhouse women's infirmary, c.1900. 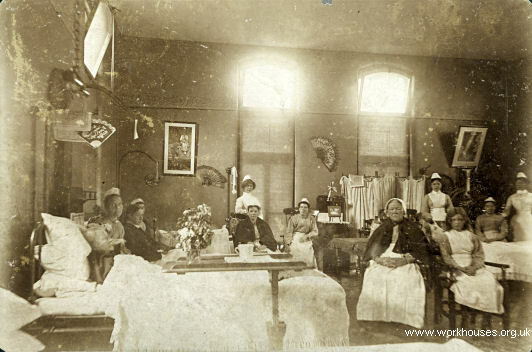 Ormskirk workhouse women's ward, c.1900. 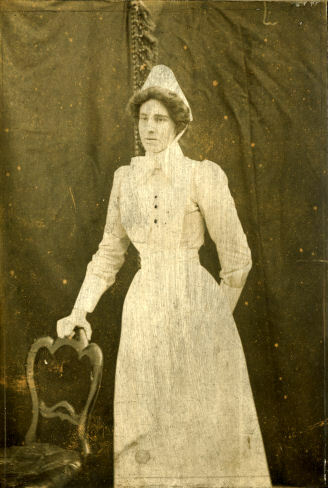 Miss Amy Masters, superintendent of women's ward, c.1900. 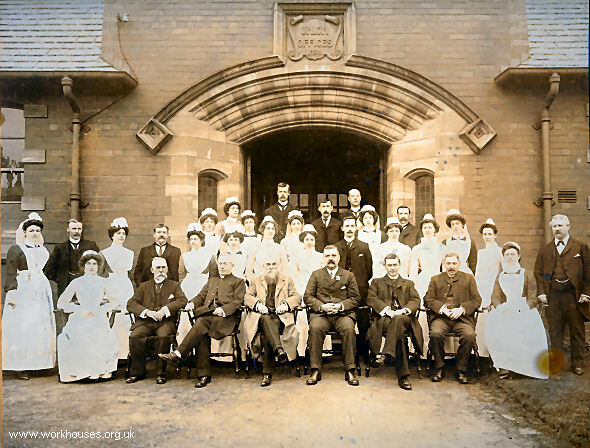 Ormskirk workhouse and Board members, early 1900s. Lancashire Record Office, Bow Lane, Preston, Lancashire, PR1 2RE. Holdings include: Guardians' minutes (1837-1930); Workhouse births and deaths register (1828-48). 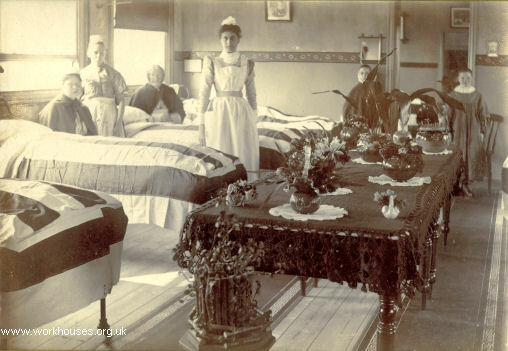 Underwood, Betty (2008) Ormskirk: Workhouse, Two World Wars, NHS Hospital (Raven Entomological and Natural History Society.) Now out of print but author can be contacted at battybellsATgmail.com (replacing the AT by an @ sign). Many thanks to Betty Underwood for contributing the archive photos.